One element impacts another and together they form the world around us. Yet the world is slowly and quietly evolving. There needs to be equilibrium or… at least semblance of it in time. You are part of this vortex of life! In this fascinating environment, 2 to 4 players compete to collect varying sets of earthly themes, and strategically and efficiently accumulate points. They can also attempt to impact equilibrium. Like in nature, players compete individually, but their actions impact each other, sometimes unknowingly helping the opponent, sometimes dealing him a crucial blow. There are many strategies, but only one winner! 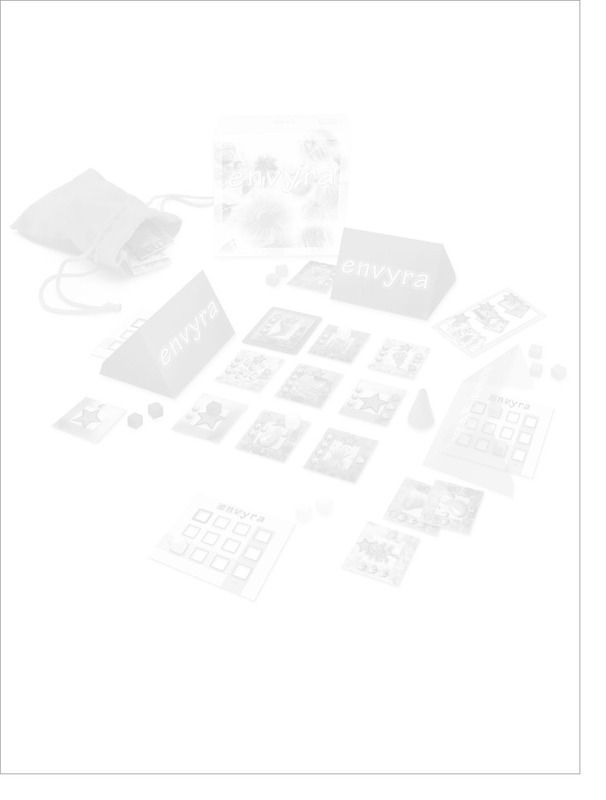 Envyra is a game of wits where players compete to capture Tiles worth varying number of points. Players can maximize their points by capturing higher value Tiles, but also by collecting specific sets of Tiles worth extra bonus points. The expansion package Equilibrium adds additional opportunities to add points to one’s score by gaining individual Equilibrium Cards. Each round consists of two stages – one where each player secretly and simultaneously selects the Tiles he wants to capture – and another where players reveal their selection and interact. Be careful – Envyra is not a game of chance. The player that best anticipates his opponents’ moves and strategically adjusts in mid-play has the best chance to be the winner. The game ends when the End Tile is captured. Each player can try to end the game when it is most advantageous to him – at that moment he has the most points – making the game more dynamic and strategic. When the game ends, the player with the most points is the winner. If multiple players end with the same point total, the player who gained the most points through collecting specific sets is declared the winner.